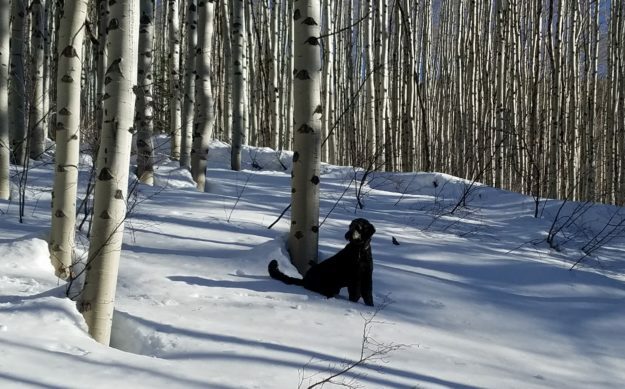 Monty chills in the aspens above EagleVail on a recent backcountry ski trip. After a weeklong respite, the Colorado high country is heading back into a snowier period for the end of March, and conditions will continue to be excellent for the final month of the stellar 2018-19 ski season at most Colorado resorts, including Vail and Beaver Creek. Now officially springtime, both Vail Valley ski areas will be winding down the season next month, with Beaver Creek closing on Sunday, April 14, and Vail wrapping things up on Easter Sunday, April 21. The state’s southern mountains got a powder day on Friday, and it’s snowing lightly early afternoon Friday in Vail. Forecasters are calling for 6-plus inches Friday afternoon into the evening, so Saturday should be soft. “The southern mountains are reporting 8-12 inches on Friday morning – enjoy the dense powder in the south! Otherwise, we’ll see showers continue across the state on Friday and Friday night with some potential for 6+ inches in the northeast mountains on Friday night,” Opensnow.com meteorologist Joel Gratz wrote Friday morning. Despite some melting over the last week, the snowpack remains above-average and very impressive across most of the state, with drought conditions subsiding to some degree. Continued precipitation and cooler temperatures would help ease out of ski season and into boating and biking season.